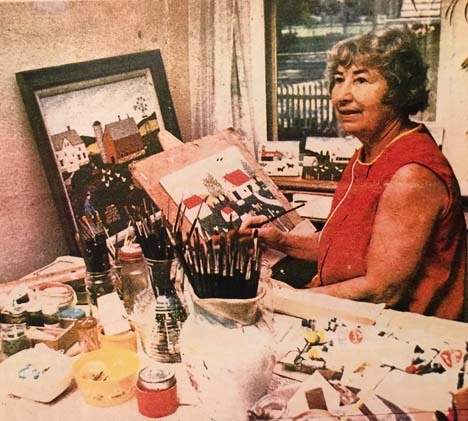 Elsie Hagert Heindl is known internationally for being the “Second Grandma Moses.” Born in Bockwa, Germany in 1908, she immigrated with her family to Milwaukee, Wisconsin when she was four years old. 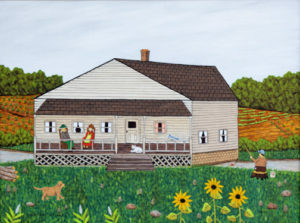 Her family of ten found a circle of friends among Germanic farming folks in rural Wisconsin so Elsie spent many happy times in farm settings as a child. She began creating art at an early age, entering and winning numerous art contests. Elsie went to work in a hosiery factory after the 8th grade and chose not to attend art school. She played and taught violin and painted for friends as a young adult. Then she married and became a mother to three children before giving in to the impulse to paint everyday. In 1951, Elsie’s father, Otto Hagert, died; Elsie decided to honor him by using his name as well as her married name to sign her work, “E. 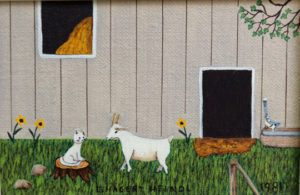 Hagert Heindl.” She joined local artist groups and her unique farm scenes became noticed by many. 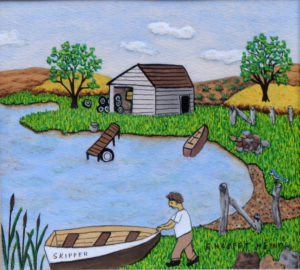 She was accused by some of copying “Grandma Moses” but she had never heard of that artist. 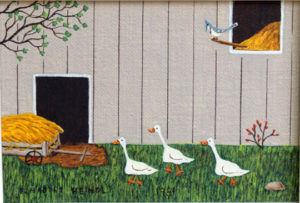 From 1960 to 1970 Elsie’s painting career blossomed. 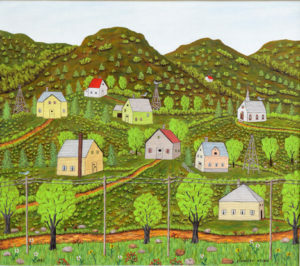 Her art was exhibited in galleries in Chicago and New York as well as at Museums in Massachusetts and Texas. 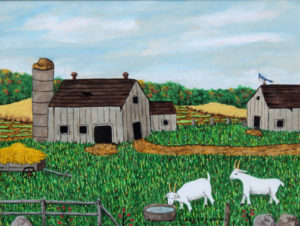 After receiving recognition in Germany and Switzerland, her husband urged her to travel to Europe where she sketched and was inspired to paint European farm scenes. The memories of her travels and of the farms that she encountered during her life, were captured by her with spontaneous delight. It is estimated that she created about 500 paintings due to her precise attention to detail, that included one tiny brush stroke for every blade of grass. E. Hagert Heindl’s rare work has been shown in prestigious galleries and was collected internationally during her lifetime. It is now found in a number of important collections in the United States, Germany, Switzerland and England.